The Boyfriend Pillow | OhGizmo! Loneliness must be painful. I don’t intend to sound poetic or anything. It’s just that when you have to resort to human shaped pillows, you know you have to start looking for a companion right quick. For some reason, thus far such pillows have been targeted to men. Here’s one for the ladies. 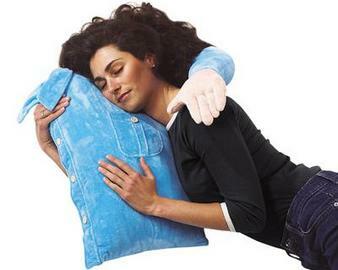 It’s The Boyfriend Pillow and it’s made from polyester velvet with plump polyfill. It’ll wrap its arms around your lonely shoulders and you can cry yourself to sleep.